We are honored to announce that YUASA and HARA has been selected Tier 1 by the Survey of Managing Intellectual Property (MIP) IP Stars 2019 Ranking, in the categories of Japan Patent Prosecution and Contentious, and Trademark Prosecution and Contentious. 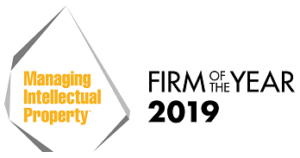 Furthermore, YUASA and HARA has been awarded the prestigious “MIP Asia Awards 2019 – Firm of the Year 2019” for patent prosecution works. We thank our clients for their continued support of YUASA and HARA and Managing IP for their recognition of our skills and expertise.